Updated Q1 2018 maps for 11 countries of the Middle East, South Caucasus and Asia are now available to the Navitel Navigator users. The Middle East, South Caucasus and Asia Q1 2018 map update includes 11 countries — Armenia, Azerbaijan, Georgia, India, Iran, Kyrgyzstan, Pakistan, Tajikistan, Turkey, Uzbekistan, Vietnam. The maps of this release contain 3 938 308 km of the road graph, 7 563 666 POI, 775 954 cities and settlements, of which 36 582 include road networks and address search. The map of Armenia includes 985 cities and settlements, of which 51 are available for road networks and address search. The map contains 13 802 POI. Total length of the road graph is 23 268 km. The information about the border of the Nagorno-Karabakh region has been updated. The map of Georgia contains 4 349 cities and settlements, of which 47 are available for road networks and address search. The map includes 4 832 POI. Total length of the road graph is 81 849 km. The address databases and road networks of Bakuriani, Borjomi, Gudauri, and Kutaisi have been updated. The map of Turkey contains 40 400 cities and settlements, of which 28 834 are available for road networks and address search. The map includes 1 826 733 POI. Total length of the road graph is 767 315 km. The road networks of Turkey have been updated – new roads, road junctions and roundabouts have been added, as well as traffic directions and restrictions revised. The map of Vietnam contains 89 852 cities and settlements, of which 765 are available for road networks and address search. The map includes 208 458 POI. Total length of the road graph is 393 234 km. The latest release has introduced new 3D models in the capital of Vietnam, Hanoi: BIDV, Chocuanam Cuanam, Crowne Plaza West Hanoi Residences, Sông Đà Tower, Tập Đoàn Thành Công, Tòanhà Hà Nội Tower, Tòanhà Vietcombank Hà Nội, Vietcombank. Important! 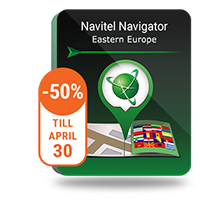 Please note that the maps of the Q1 2018 release only work with Navitel Navigator 9.7.2493 or higher.